David Needham is a survivor. After the train accident at Mebane, North Carolina earlier this year, he was the one “seriously injured” passenger we locals heard about on the news. The one sent to the local UNC hospital. And although he told those around him he was ‘just winded,' the truth was, with a crushed pancreas, a severed abdominal artery and two severed abdominal veins, he could have bled to death on the train tracks waiting for the ambulance to arrive. David, originally from Manchester, England, has been part of the Duke engineering faculty for more than 23 years in the Department of Mechanical Engineering and Material Science. He is the inventor of a new anti-cancer treatment called Thermodox, currently in phase III clinical trials. We thought his friends and former students would like to hear about what happened to him. So here is the story of David’s accident, the life-saving surgery, and the recuperation that followed. On May 13th, a truck pulling a trailer with a tractor on it got stuck crossing the railroad track in Mebane, North Carolina and was struck by an oncoming train bound from Durham to Charlotte, NC. When the train crash happened, most news outlets reported that passengers had escaped without serious injuries. Then they noted that none of the injuries were life threatening and most patients were treated and released that Thursday afternoon. One news outlet must have dug a little deeper, and reported that one patient was in serious condition at UNC Hospitals. That patient was David Needham. It wasn’t until David was on the operating table later that day that the lead trauma surgeon Dr. Goodwin discovered during exploratory laparotomy David had sustained a severed abdominal artery, two severed veins, a lacerated pancreas, and a crushed pancreatic duct. Needham was lucky; it was only after opening him out that he lost 2 liters of blood. Goodwin told David's girlfriend, Dr. Carla Gene Rapp, as he came out of the operating room that David's good health and above average abdominal muscle tone had stopped much of the internal bleeding until he was on the table. At the time Goodwin was an Assistant Professor of Surgery at UNC and is now at Oklahoma Med Center. Just before the accident, David was working on his laptop at a table booth in the first seat of the last carriage of the train. He was reviewing a new manuscript written with his long-time collaborator Mark Dewhirst of Duke Radiation Oncology that detailed new work the team was about to send for journal review. David had boarded the train in Durham at 7:10 a.m., and settled in with a cup of decaf from the restaurant car. As he sat, his abdomen was just a few inches away from the sturdy 1-inch thick table. 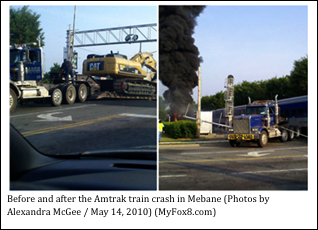 By 7:47 a.m, the train was travelling at 79 mph and about to pass through the crossing in downtown Mebane, NC. David remembers that without warning there was an incredibly loud bang, sounding almost like an explosion. The train had hit a large track hoe on a stalled low-boy tractor trailer that was stuck across the tracks of the Mebane crossing. As the train hit it full on, the track hoe fell off the trailer and landed on the north side of the tracks. The train dragged the trailer, now wedged under the train, where it ruptured the diesel fuel tank. The engine came off the tracks, decelerating with a force of several Gs. On the train, Needham was still travelling at 79mph. The impact threw him forward into the edge of the 1-inch table which hit his abdomen. After that initial impact, David pushed himself off the table edge with his arms as the train went from 79 mph to zero in just a few seconds. He later said that it seemed a lot longer. He heard screaming and crying, and the conductors were dashing through the carriage checking on everyone. Feeling nauseous and dizzy, and coming over with a cold sweat, he spent a few minutes dry-retching in the bathroom while everyone else was ushered from the train. Eventually the conductors came to get him off the train. “Come on Buddy, can you stand? Let’s go, we gotta get you off the train, the engine’s on fire, and it’s a crime scene now,” the conductor said. Struggling to his feet, David was helped out of the carriage door onto the tracks. The sunlight hitting his eyes felt unbearably bright, and he was weak, nauseous, and dizzy. The conductors brought him to the back of the train where he laid down right there on the tracks, just under the barrier. With the crash happening right downtown in Mebane, EMT was there immediately. "They probably heard it in their break room," David jokes. A kind faced, young fireman asked him his name, where did it hurt, and where was he going. “It's my guts, I just feel winded. I’m on my way to pick up my girlfriend in Charlotte,” David told him. “That’s OK, just lay back, the ambulances are on their way,” the EMT assured. Sirens could be heard getting nearer in the distance. Needham tried to stand up, but felt dizzy and laid back down on the railway tracks. The EMTs became more concerned. “Where are you hurt? Does this hurt, how about this?” They probed his head, neck, fingers, legs. “Its my abdomen, No, No, just my abdomen,” David replied. They placed an oversized collar on him just in case, and strapped him to a board, and carried him to the ambulance. “Do you want to go to Durham or Alamance?” they asked. “Let’s go to Alamance, my girlfriend’s Mum and Dad live in Burlington, they can come and pick me up,” David said, fully expecting to continue his journey later that day. And so off they went to Alamance Regional Hospital. He was asked if he needed to call anybody, so he used the EMT’s cell phone and, remembering her number, spoke with his girlfriend in Charlotte, North Carolina, Carla Gene. Arriving at Alamance Regional, he was bounced (gently) out of the ambulance, ceiling tiles and strip lights whizzing by, and wheeled into the Emergency room. The Emergency Trauma team did their thing sticking tubes into him EVERYWHERE. Up his nose and down his throat, into his bladder as the nurse was so apologetic. “I’m so sorry dear, I’m sorry,” she murmured. “Ouch! You should be!” was his politically incorrect reply. By then, Carla Gene’s parents, Dr. and Mrs. Rapp were there among the melee of nurses, aides, other staff and physicians that constitute the rapid response trauma team. They took an x-ray in the ER, then wheeled David off to get a quick CT scan. The scan showed a pooling of liquid in his abdomen, and so the decision was made to send him off to UNC Memorial Trauma Center for further observation and more advanced attention. So it was back in ambulance and off they went to UNCH, with the EMT person gently cradling David’s head, still supported by the neck collar. Everything was going smoothly, but then halfway down Highway 54, the ambulance guy leaned forward. Looking up, David could just see the man’s upside-down face. “Mr. Needham, you are not going to believe this, but we are losing power, the ambulance is breaking down. I guess it’s just not your lucky day,” he chuckled. “Guess not,” Needham said, resigned. They both laughed. Little did they know then, he was potentially bleeding to death. They pulled off onto the grassy side of Highway 54 and it only took 10 mins for a new ambulance to arrive, a quick transfer, and they were off again to complete the journey to UNCH. David watched through the ambulance windows at green trees and Carolina blue sky and then brick buildings and concrete as they arrived at UNC Memorial Trauma center. Unfortunately, bouncing out of the ambulance once more was just a bit too much this time. While they careened through the emergency room doors, David vomited into the neck collar the power bar and banana he'd had for his breakfast that morning. The ICU at UNCH was just as crazy and frantic as at Alamance, as folks were checking vitals of blood pressure, temperature, putting in an IV line, and he was asked again who should be contacted. And then, in the middle of all the craziness, David remembers a calm figure appearing. Almost angelic, he had an aura of peace, David says. It was Dr. Goodwin, the surgeon on duty, and the person ultimately responsible for saving David’s life. “So, Mr Needham, the CT scans show pooling of liquid. We can wait and keep monitoring you, or I can go in and fix it”, Goodwin said. Without hesitating, David told him to go in and fix it and that’s the last he remembered for 2 days. This is where Carla Gene picks up the story. She was in her apartment in Charlotte when she heard from David, and was herself recovering from several days on an IV in Presbyterian hospital. She’d had an adverse reaction to antibiotics she’d taken to treat a simple sinus infection. At the time, she'd been slowly packing a suitcase and getting ready for David to arrive, and their drive back to Durham. The phone call changed all that. She immediately decided to go to David at the hospital, but the normal two and a half hour drive took five hours as she battled her own weakness with several resting stops. David had told his doctor that Carla Gene was his unofficial health care proxy, so she talked several times with Dr. Goodwin, initially, to get David’s status going into the OR, and then for a report after the first operation. Goodwin and the OR team carried out an exploratory laparotomy as Carla Gene was driving up from Charlotte. “We painted the ceiling with blood!” he told her over the phone. Amazingly, and luckily for Needham, it was only when they opened him up that he immediately lost 2 liters of blood. The laparotomy showed two lacerated veins and a lacerated abdominal artery. On one of her rest stops, Goodwin told Carla Gene that David’s good health and abdominal muscle tone had basically kept much of the internal bleeding in check by keeping his internal organs tight and the lacerated abdominal artery in place. Otherwise he could have lost all that blood while lying on the railway tracks. As it was, the blood loss occurred during the operation with surgeons and staff in attendance. Funny thing though, David already has a reputation for being lucky. When he was 14 years old, and a keen supporter of Manchester United soccer team, he said bye to his Mum and ran off down the road to catch the bus to Old Trafford and the Man Utd stadium. Racing around one corner, and then dashing straight across the road, he hadn’t looked and was hit by an oncoming car--a mini. He landed on his backside in the middle of the road. His left ankle had been caught under the front fender of the car. He tried to stand but the searing pain in his leg had him hopping in the middle of the road, trying to get his shoe. Realizing that the cars from behind had stopped but the ones coming head on hadn’t, he knew he needed to get out of the middle of the road quickly. And then, as lucky as you can get, the first vehicle to screech to a halt, was an ambulance. By the time his parents arrived at the hospital, David was in the ER, still wearing his red and white scarf, and now supporting a brand new white cast. He sometimes uses this story in his seminars on his cancer treatment. “And then the first time we tried it, it cured all the mice, 11 out of 11,” as he flashes up the data, and up pops the phrase, “How lucky can you get?” Really. How lucky can you get? But back in the operating room after his train crash, there was much moving and jostling of his internal abdominal organs, as all the excess blood was being sucked out and the surgeons were trying to identify further damage. And they found some. The force from the train table had lacerated his pancreas and crushed the secondary pancreatic duct. The Trauma Team kept David intubated and on a ventilator that breathed for him during the long anesthetized phase. The next day, Friday, still on the ventilator and still under anesthesia, a second endoscopic procedure was carried out that placed a stent into the crushed secondary pancreatic duct. Carla Gene arrived Thursday afternoon and stayed with David all through the night and all the next day. By Friday night, weakened herself, she had to get some rest. David's long-time friend Dempsey Elks, a bass player in their band, stepped up, and came to sit with David through that Friday night. Elks, like David, describes himself as not a big fan of hospitals, but he overcame his feelings to make sure someone was with David through that first night. “It was crazy, folks were coming in and out every 15 minutes it seemed, and if there was a beep or a change in any noise, I was like, Nurse…?” Elks said, describing that first night. David’s medical team decided to keep the ventilator and intubation going so that if, down the road through the night, his acid-base balance needed tweaking, they could do fluid resuscitation. Although David’s relative fitness had saved his life as he lay by the train tracks, it later complicated things for the doctors. On Saturday, at lunchtime, David finally woke up. And it was dramatic. He sat bolt upright in the middle of a nightmare, and stared at Carl Gene with a worried look on his face, “Did this really happen,” he asked. By Sunday, David was out of the ICU, and then stabilized in step-down and regular wards through the week. The last part of the body to “wake up” after anesthesia is the digestive system. A tell-tale sign that he was ready to go home was a first bowel movement, even though it had to be helped by a glycerin suppository. Discharged on Friday 21st May, he had been in the excellent care of the UNC Trauma Team, doctors, nurses, nurse’s aides and staff for just over a week. They got him on solid food, up and walking gingerly around the corridors and up and over some steps in rehab lab, and then off the Patient-Controlled Analgesia (PCA) -- a means for the patient to self-administer pain medications intravenously by using a computerized pump, which introduces specific doses into an intravenous line. With David questioning every aspect of his post surgical treatment, the Grand Rounds doctors joked that they were glad to see him go. And the nurses had been asking “Who is this guy?” because so many friends from Duke kept calling to get updates. And so with a Fentanyl patch on his arm, and a bag full of painkillers, anti-nausea drugs, laxatives, and dressing supplies, he was finally home, and under the expert care of Carla Gene, a fully trained nurse who was then Professor of Nursing at Queens University in Charlotte, NC. Before his accident, David had a busy summer of invited seminars planned. The first casualty was his trip to the Netherlands, where he had been invited to give a seminar at the Erasmus Medical Center Rotterdam, and a Keynote Lecture at the 26th Annual Meeting of EUROPEAN SOCIETY for HYPERTHERMIC ONCOLOGY also in Rotterdam. Needham was to give his talk on the Thermal Sensitive Liposome on the afternoon of May 20th, preceded in the morning by his friend and close colleague, Mark Dewhirst, (Radiation Oncology, Duke), who would report on its preclinical and clinical successes. When Mark was told of David’s accident, he stepped in and gave both talks and was excited to report later that fully 30% of the hyperthermia meeting was filled with others reporting on the use of the thermal sensitive liposome that Needham had invented in 1996 and they had developed together. David had also planned to take advantage of being in Europe by stopping off in Manchester to see his mother, Audrey, and brother, Stuart and family. With those plans out the window, David’s brother Stuart decided to come to North Carolina and visit for David’s first week at home. He could then give first hand reports to his mother who was understandably worried, and frustrated at the lack of immediate contact. A Skype video call can only do so much. It was a good visit, with Stuart even getting in a game of golf and substituting for his brother on David’s dart team, the "Darty Old Men," in Chapel Hill. And In the weeks and months of recuperation that followed, they kept in touch, and David hopes that maybe in the Fall he can finally go home to Manchester and make a trip up to Vancouver to reconnect with his family for that “glad you are alive” hug. While he’d been in the hospital several friends and colleagues were keen to check in on him, but weak and still “out of it” on the narcotics, David had thought best to put visits off. Once home though, he could entertain a few visits. One in particular was very special. His ex-post doc advisor Professor Evan Evans at Physics UBC, then in residence at University New Mexico, travelled especially to see him, accompanied by their friend and colleague from Duke, neurobiology Professor Sidney Simon. “I just wanted to see for my own eyes that he was doing OK,” said Evan, who flew in for the overnight visit and then flew back to Albuquerque that same afternoon. Although usually he enjoyed a busy seminar schedule, by late July, David was forced to finally say no to several other trips that had been planned for the month of August. He was still dealing with the open wound that was still draining fluid and required packing. He also had to cancel two class session he had planned with Dr. Jennifer Carbrey of Cell Biology at Duke on David’s “Mapping Engineering onto Biology” approach to reverse-engineer problems nature solved. He, Carbrey, and the other first year med student program directors thought the class would be a good way to introduce the concepts of his hierarchical design analyses to potential doctors. But ultimately the team decided the 100-student class might just be a bit too soon in his recuperation. As it stands at the moment, no one knows exactly how it’s all going to work out, but David is doing incredibly well. A second endoscopy was required to check for and remove the stent that was placed in the secondary pancreatic duct, but by the time the endoscopy was carried out the stent had gone, passed during the week between the x-ray to show it was there, and the endoscopy to remove it. For the past 13 weeks Carla Gene, and then David himself (while she was away packing and moving back to Durham from Charlotte) have been packing the hole through his abdomen with ½ inch and then ¼ inch gauze strips as the 2 inch open drain hole in his abdomen got smaller and smaller. The gauze, which was packed into the hole with a Q-tip twice a day and then 3 times a day, was supposed to wick any fluid that made it from the leaking pancreas to the drain hole down the remnants of a drain track made by the original plastic tube of the Axiom drain that was placed to help remove the initial pancreatic leakage. The main thing now is to see if the pancreas can heal. This very ephemeral organ is not suturable being so finely divided and sinusoidal, (surgeons avoid it like the plague). Drainage from the pancreas has continued and the open hole has been its escape route. Just last week, he was advised to stop packing and just dress the wound and allow it to drain as long as it’s patent, and then heals. As of today, Aug 9th, it has finally healed up and no more drainage occurred overnight. This could be a good thing if back pressure stops the pancreas from leaking and it has a chance to seal up. However, pancreatic juices could still escape and collect, and a pseudo cyst might form that may have to be removed in 4-6 months from now. Or, it could all heal and he will be fine. The doctors at UNC Trauma told David in that first week that it could be weeks to months for the pancreas to heal. And that prophetic prognosis has turned out to be true. After 13 weeks of draining the pancreatic exudate from the leaking, bruised and damaged pancreas, his doctors at Duke say it’s all watchful waiting now. No one really knows. For now he’s watching for changes such as fever or discomfort and pain. A couple of weeks into the convalescence, David found himself watching a leaf bud and form on one of his rubber plants, and he realized how much he had slowed down. He says this slowing down actually helped make his dart throw more accurate. But more importantly, he says the whole episode, the accident itself, coming so close to the edge, the kindness and concern shown by family, friends and colleagues, though has given him a new focus on life in general. Even prior to the accident Needham was developing a new direction and priority for his research. 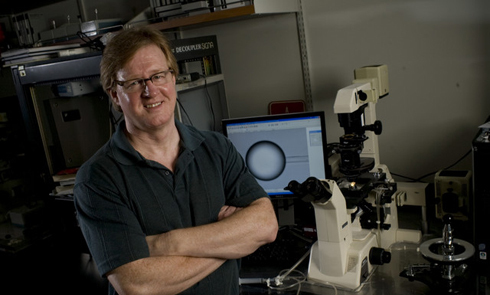 The most important projects for Needham were to renew his NIH RO1 that seeks to formulate and deliver new peptides for therapeutic intervention in conditions like diabetes; to help his graduate students get challenging and productive post doc positions by helping them to write new proposals; and to translate his new invention, the MicroglassificationTM process for preserving and formulating therapeutic and diagnostic proteins and peptides. Since he started to get back on his feet in late June, and could concentrate for longer than a couple of hours without having to take a nap, he and his lab and industrial collaborator in LA have written and submitted those four grant proposals. Three new papers will also go in before classes start in the fall. Speaking of which, with a new FOCUS class to prepare for this fall, he is also very committed to pursuing his educational mission that aims to convert all “teaching at” students to “learning by” students. Once all this gets underway, of premier importance, is for him to follow through with a new cancer treatment idea, of using the cancer’s own uptake mechanisms to create a Trojan horse that delivers tumor specific target molecules where toxicity to the rest of the body is less of an issue, but their delivery in therapeutic quantities is paramount. Since the accident, David has lost 15 pounds. He has called it his crash diet, as in train crash diet, but does not recommend it as a weight loss program. Not even a 79 mph train crash can quell his British wit.